Review by AllTheBestFights.com: 2018-03-10, some good exchanges between Richard Commey and Alejandro Luna but it is not enough to get three stars: it gets two. Richard Commey entered this fight with a record of 25-2-0 (22 KOs=88%) and he is ranked as the No.6 lightweight in the world (currently the #1 in this division is Jorge Linares) but he lost two out of his last three fights, against Robert Easter Jr (Robert Easter Jr vs Richard Commey) and Denis Shafikov (Denis Shafikov vs Richard Commey); after this bout he defeated Hedi Slimani in 2017. His opponent, the undefeated Alejandro Luna, has a perfect boxing record of 22-0-0 (15 knockouts) and he entered as the No.38 in the same weight class. Between 2016 and 2017 he won over Alan Herrera, Naim Nelson and Andrey Klimov. 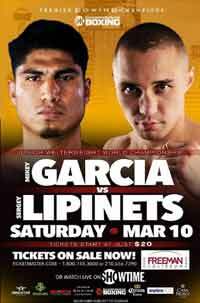 Commey vs Luna is on the undercard of Mikey Garcia vs Sergey Lipinets. Watch the video and rate this fight!